I used to big a big fan of Stanford Shopping Center going the 1980s. I love the outdoor atmosphere and the selection of shops, which, though not great, is certainly better than most malls. I’m disappointed that some of my old favorite stores are no longer there: Hear Music, Phileas Fogg’s Travel Shop, EB Games, and a sports bookstore whose name I forget. But there are some new, good stores too like Rugby by Ralph Lauren. I remember the Banana Republic there before the Gap bought it and it looked like a Jeep had crashed into the storefront. That was my favorite store when I was a kid just because of its facade. 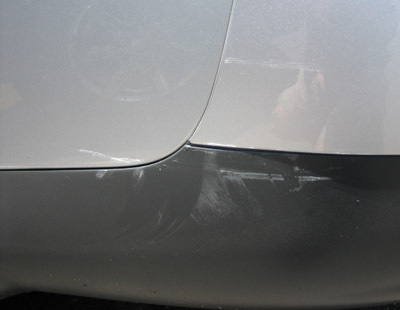 Speaking of car crashes, that’s exactly why I am no longer a fan of Stanford Shopping Center: This Sunday while I was parked near Max’s, someone hit my car’s rear bumper, valence and left fender causing easily $3,000+ in damage. This person did not leave a note. Leaving a note is something that people really should do if they hit someone else’s car while it’s parked. In fact, I remember hearing that it’s the law to do so. Things like this have happened to me in the past, and I made sure to park all the way out along Sand Hill, next to a tree on the right and a couple empty spots on the left. I pulled into the middle of the spot and then readjusted, moving my car all the way to the right of the spot—next to the tree—so a car parking on my left wouldn’t hit mine. And yet. It happened anyway. I called the Palo Alto police to file a police report, but they refused to send an officer because Stanford is on private property. The woman at the police department directed me to Stanford Shopping Center’s private security department. I went to the directory in the middle of the shopping center and called the security number. The woman who answered the phone there said they would send an officer over. When the officer arrived, he said that he would not be able to issue me a report and that Stanford did not have security tapes that I could see. I didn’t expect there to be a videotape of the incident involving my car because I parked so far away. However, what disappointed me tremendously is that the security officer said that I would need have the court subpoena them if I wanted to obtain access to any sort of report on the incident. Of course, these sorts of reports are generally useful for insurance purposes, but the security service at Stanford proved to be entirely useless. I understand that these people are trying to protect Stanford, but to do so at the great expense and frustration of their customers seems to me self-destructive. This is one of the worst customer service experiences I’ve had anywhere, especially since I now need to have two of the largest pieces on my Audi repainted, and we all know that once you get something repainted, especially on a German car, it never looks quite the same. I will probably still shop at Stanford, just not as frequently and without any enjoyment, but I certainly won’t be driving there. If you were at Stanford Shopping Center on Sunday, May 27, 2007, and you happen to have seen the car that hit my silver 2002 Audi A4, please email me. Judging by the paint transfer, it looks like the car that hit me was white. For the other auto detailing enthusiasts out there, I did try to take out the scratches on the bumper with SSR 2.5 and a white pad on my Porter Cable, but wasn’t able to minimize the scratches at all. So, it looks like I’ll be making a trip to the body shop soon. Can we care about genocide? According to Kristof, Slovic “argues that we cannot depend on the innate morality even of good people. Instead, he believes, we need to develop legal or political mechanisms to force our hands to confront genocide.” Kristof, however, believes that we need a public outcry that can only be promted by media emphasis on a single, suffering, sympathy-inducing Darfurian—or a Darfur puppy. “Style is character”: at several points in her career, Didion has offered this sentence as one of her core beliefs. But what does it mean? Not that you are what you look like, or that what you look like is what counts. Style is the writer’s site of decision-making—literally, the site of actions whose integrity can be measured. It is the place where the self meets the world. And so Didion felt a need to do what for her was, by her own admission, extremely difficult: go out and meet the world. Because Didion’s later reporting on politics, often for this magazine, took a turn generally more critical of a reawakened American conservatism— and critical, also, of paralyzed Democratic accommodation—it’s sometimes been said that at some point in the decades after these first two books she was radicalized, or at least nudged toward something more like traditional liberalism. To argue this is to ignore how much the writing life has always been her central concern, and how much politics has always been a secondary, if all too gift-giving, subject. All along her aimed-for target has been behavior that is in error, above all behavior that resists—and therefore demands from the observing writer—irony. My favorite line from the piece, and the one with which I identify most, comes from Didion herself in one of Kerr’s epigraphs: “to be paralyzed by a past no longer relevant.” She’s talking, in “Notes from a Native Daughter” about the fate of those in the Sacramento Valley, but also, as usual, about everyone. The New York Times uses the occasion of the Atlanta Journal Constitution’s eliminating the position of book review editor held by Teresa Weaver to once again cover the dichotomy between traditional newspaper coverage of books and coverage in the blogosphere. Newspaper reviews, for me, occupy a sort of middle-ground: they can never cater to niche interests the way that blogs can while they also don’t provide the sort of in-depth, well-considered review that one might find in the New York Review of Books or the New Yorker. They do, however, provide some level of volume, i.e the sheer number of books they review, and consistency, while covering a broader range of subject matter than any individual blog could.